Officials said dozens of tourists were let go after being informed of their inappropriate actions. Phonm Penh: Cambodia has charged 10 foreigners arrested for "singing and dancing pornographically", officials said Sunday, as the kingdom cracks down on racy behaviour at popular tourist sites. The group appeared in court three days after police arrested them Thursday at a villa in Siem Reap, the town connected to Cambodia's famed ancient ruins of Angkor Wat. Samrith Sokhon, a prosecutor at the court in Siem Reap, said the 10 suspects were being charged with producing "pornographic pictures and materials", which can carry a maximum one-year sentence. He said five of the 10 defendants are British nationals, but did not provide additional details. Cambodia's national police said on its website over the weekend that the other defendants included two Canadians and one New Zealander. All were accused of "singing and dancing pornographically", the police said in the post, which showed photos of pairs simulating various sexual positions at a party. Several people in the original images, however, do not appear in the group shot of the 10 defendants later posted by the police, and authorities did not say who had taken the suggestive photos or when. Some of those arrested were expats and others were tourists who had been in the country for several months, said Duong Thavry, chief of the Anti-Human Trafficking and Juvenile Protection Department in Siem Reap. "We cracked down on them because they committed activities that are against our culture," she said. 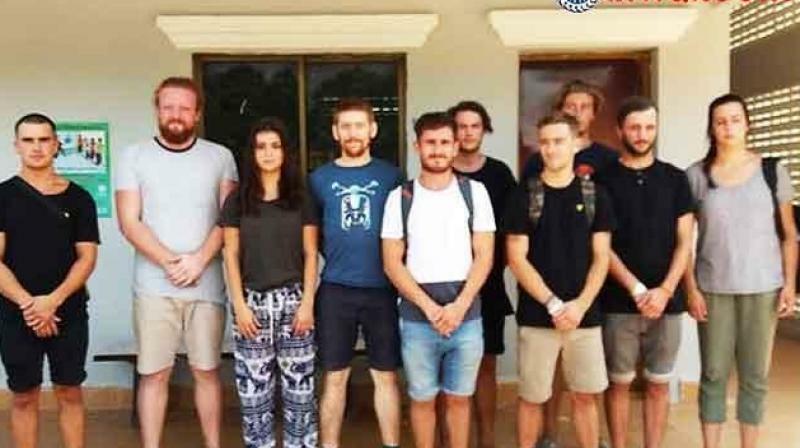 Britain's Foreign Office said in a statement that it was in contact with the British nationals arrested in Cambodia and was providing support to the families. The Angkor Archeological Park, a world heritage site, showcases the remains of the different capitals of the Khmer Empire, dating from the 9th to the 15th centuries.